This original recipe was from Cooking Light. It sounded tasty, but I wanted to tweak some of the ingredients for our family of Type A and AB blood types. What I love best about it is that it tastes good warm or cold. That means it’s great for those days when you have baseball practice or piano lessons after school and are running around with no time to prepare a healthy meal. Just make it ahead and it will chill in the fridge until dinner time. It tastes great packed in lunches the next day, too! If using dried lentils, prepare as directed. Prepare quinoa as directed. Remove from heat; cover and let stand 5 minutes. Fluff with a fork. While quinoa stands, steam broccoli florets, covered, for 3 minutes or until tender. Combine ingredients for dressing (water through sea salt). 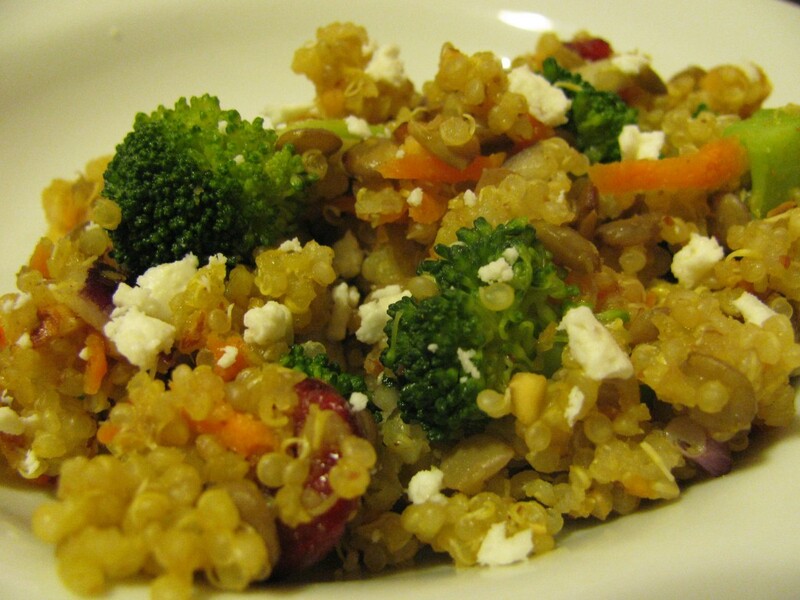 Combine quinoa with broccoli, onion, carrots, cranberries, almonds, and lentils. Next, pour dressing over top of mixture, tossing gently. When ready to serve, sprinkle with feta.